The BCG Matrix explained - How does the BCG Matrix work? How does the BCG matrix work? The BCG matrix assesses the company’s product portfolio by placing each product, division or SBU (strategic business unit) on a 2×2 grid. How does the BCG matrix work in detail? The placement of products on the grid is done by investigating two dimensions, which are the axes of the grid: the product life cycle and the experience curve. Since both criteria are rather hard to quantify, proxy values are used to illustrate these two dimensions. The product life cycle is reflected by market growth, and the experience curve is mirrored by the relative market share. These two values have to be identified for each product/division/SBU to place them on the grid. Based on the position of each product/division/SBU on the BCG matrix, investment or disinvestment decisions can be taken. The graphic below shows the BCG matrix. How does the BCG matrix work? To understand this, you first need to understand what the BCG matrix actually shows. The two axes have been introduced before. On the vertical axis, the market growth rate provides a measure of the market’s attractiveness. On the horizontal axis, relative market share serves as a measure of the company’s strength in the market. By dividing the BCG matrix into four fields, four types of SBU can be distinguished. These are explained in detail below. If you want or have to conduct a portfolio analysis using the BCG matrix, you need to know where to get these two numbers for each SBU. The market growth rate can easily be researched: usually, you will find plenty of data for almost every industry and market online. 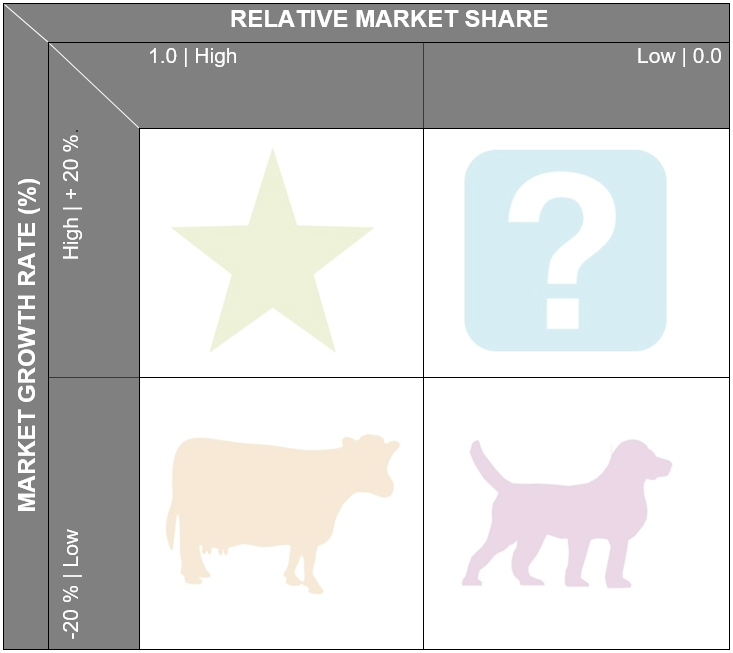 The relative market share is computed by dividing the company’s market share by the market share of the strongest competitor in that market: Relative market share = Company’s market share ÷ largest competitor’s market share. Now that we have plotted the different products, divisions or SBUs on the BCG matrix, we need to know what to do next. So how does the BCG matrix work and help to derive strategic decisions? To arrive at these decisions, we need to understand the four types of SBU that are distinguished by the Boston growth-share matrix. Careful analysis is needed to determine whether to invest or not. The company should try to “milk” the cash cows as long as possible. The company should divest dogs, as these products have a negative effect on the overall profitability of the company. Instead of carrying dogs along, the company should better focus on products or SBUs with greater potential. The ideal situation as suggested by the BCG matrix is the following: The company invests in promising Question marks to turn them into Stars. By further investing, Stars are turned into Cash cows. The company harvests all the cash until the Cash cows eventually turn into dogs. At that point, the company divests the product or SBU and focuses on more profitable opportunities. The table below summarizes the characteristics of the four types of SBUs in the BCG matrix and shows the strategic implications for the company’s long-term planning. 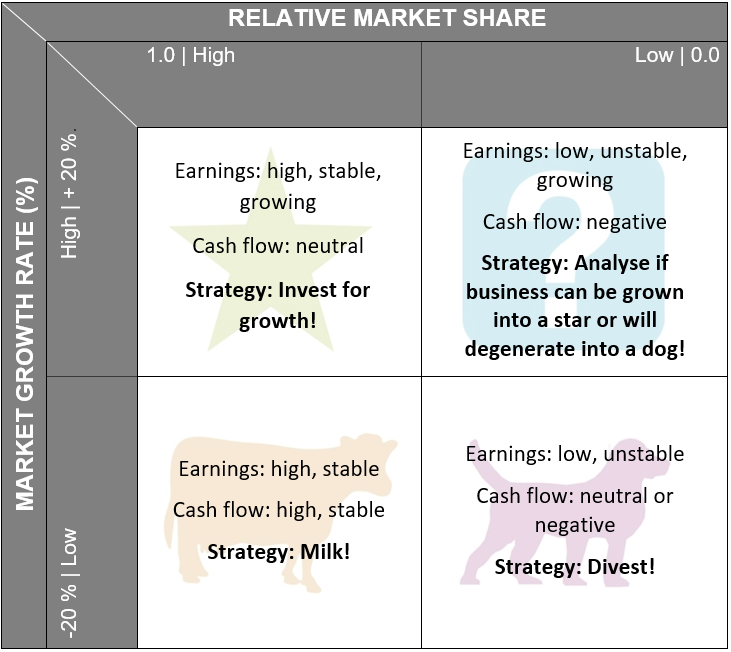 Strategy implications of the BCG matrix – How does the BCG matrix work?